When FIFA were looking for an experienced groundsman to undertake the newly created position of Senior Pitch Management Manager, they needed to look no further than Alan Ferguson. In this exclusive interview, the genial Scot explains what his role will involve heading up to the 2022 Qatar World Cup. 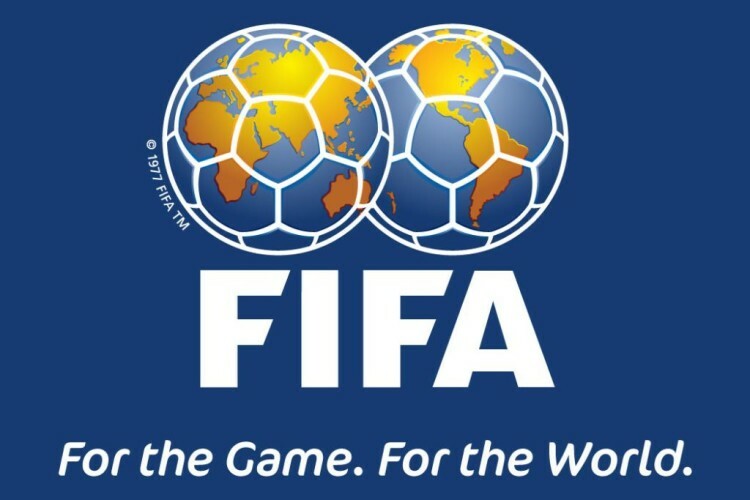 Since its inception on 21 May 1904, in Rue Saint-Honoré, Paris, FIFA has governed world football and delivered twenty-one World Cups. As time has moved on, the Women's World Cup has become more prominent along with various men's and women's age group tournaments from Under 17s upwards, totalling seven competitions played on grass. This growth in activity has been matched by increased expectations of the pitches these showpiece tournaments are played on. 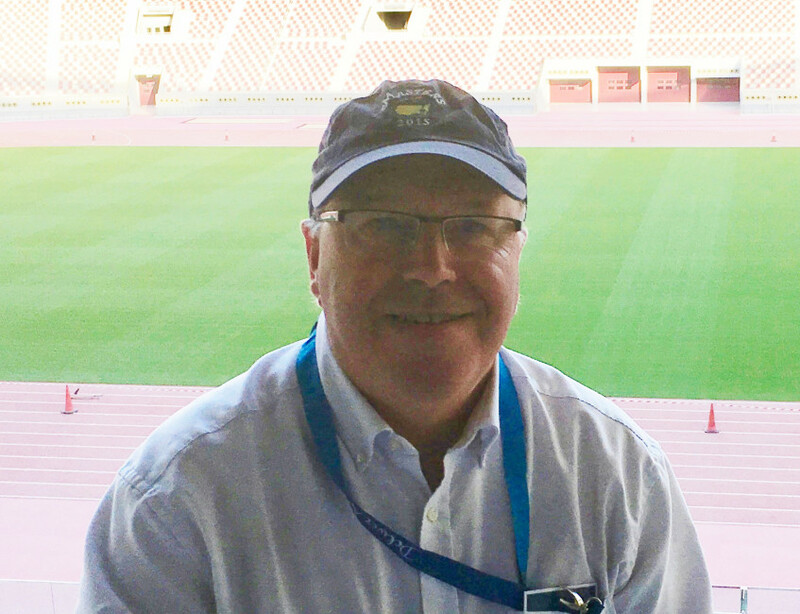 For the first time in their 114-year history, FIFA has brought pitch management in-house and appointed Alan Ferguson to a role that has him oversee every pitch affiliated with these FIFA tournaments. His objective is a simple one - provide the best surfaces possible for every tournament. However, the scale of this task is something altogether different. 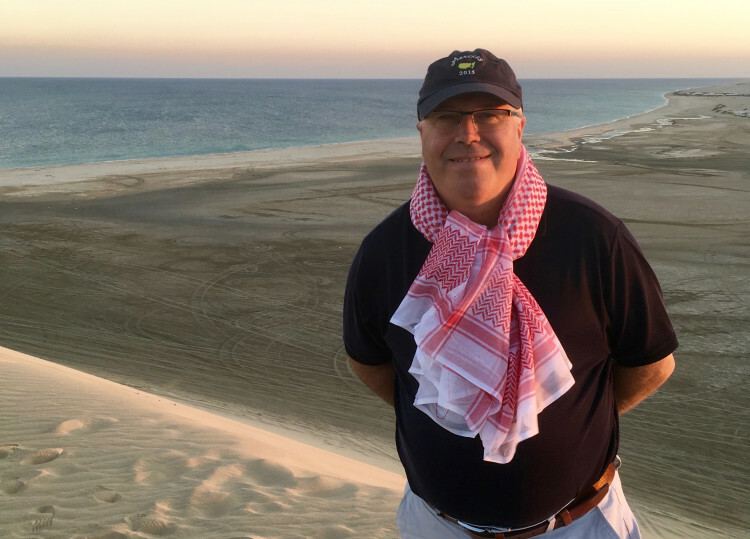 Alan arrived back from Qatar, the host nation of the 2022 World Cup for the first time, at the end of November and has seen the venues that are being constructed in the desert that will soon been under his control. 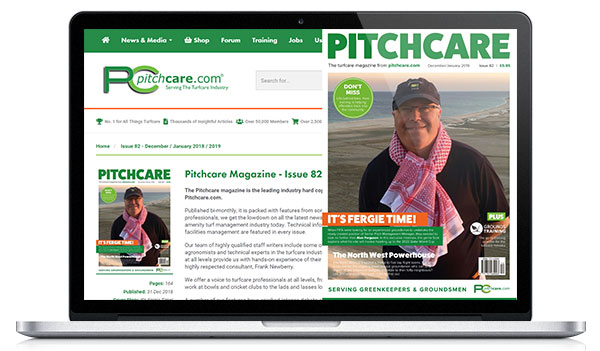 Pitchcare: Your role at FIFA is a completely new step for the football governing body as you will be the first in-house pitch expert. 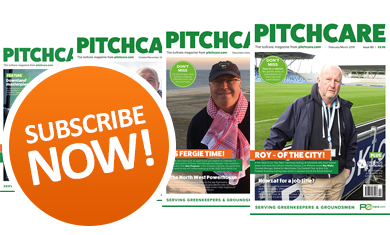 Why have they decided to manage pitches themselves going forward? Alan Ferguson: I was appointed to the position of Senior Pitch Management Manager. As you say, this is the first time that FIFA has taken the management of pitches for their tournaments in-house. The role has been created as part of a restructure that has been taking place over three years. I am responsible for supporting the various FIFA tournament managers with the selection of training and stadium pitches for all tournaments, wherever they may be held. Once the initial selection is made, I work with the Local Organising Committees (LOCs) to ensure the pitches are delivered in line with what coaches and players would expect at a World Cup and FIFA Club tournaments. I knew I was coming into a big job but, having been here for three months, I now appreciate the scale of the challenge. I thought the dual role I carried out with the FA from 2015 to 2017 - overseeing the pitches at Wembley and St. Georges Park - was off the scale, but the FIFA role is truly global and on a different planet. It is a bit surprising that we are in late 2018 and this is the first time FIFA will have an in-house pitch manager but, that said, I am delighted to be the person who has been given the opportunity to oversee FIFA's pitch management operation. In between now and the Qatar World Cup, there will be fourteen tournaments to prepare for because the youth tournaments are played every two years and the Club World Cup every year. The main focus will be on Qatar; a considerable amount of time will be spent supporting and servicing the other World Cups in the cycle. PC: You recently arrived back from your first visit in Qatar, what were your first impressions? AF: There has been a lot of discussion on Qatar since they were awarded the World Cup, but you have to take your hat off to them for what they have already achieved. On first impressions, you cannot help but be impressed by the developments and progress made. A lot of good work has already been done looking at stadium design and pitches, and the role of FIFA now will be to work with our colleagues in Qatar to ensure the best from Russia is merged with the best from Qatar to produce a memorable finals. PC: FIFA usually like to implement a Legacy Programme with their Stadia. How many are being built for the World Cup and what is the Legacy Programme for them? 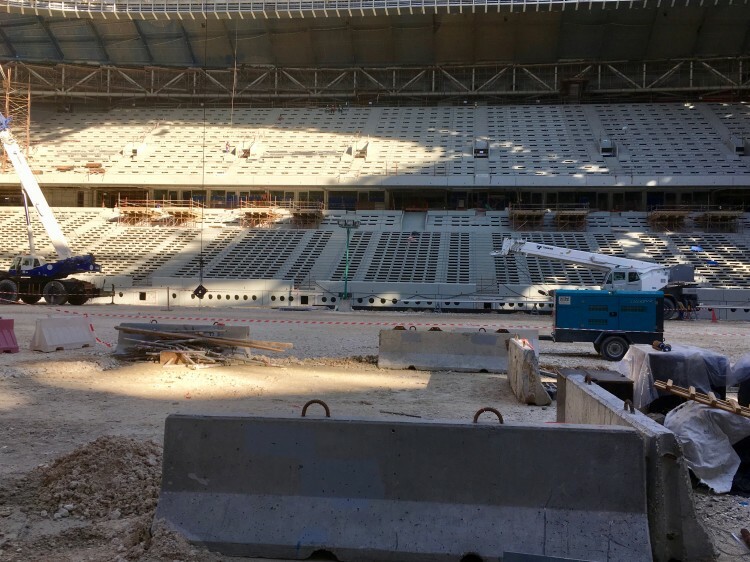 AF: Eight stadia will be used to host the 64 games. There will be a reserve stadium, so nine in total. Right away we have the first challenge as the finals were held in twelve stadiums in Russia with 64 games. I am confident, if we use what was successful in Russia to start the project in Qatar, we will produce excellent surfaces for the 2022 finals. Khalifa international stadium is the first to be completed and is currently in use. Three more will come into use over the course of 2019, with the remainder due in 2020. Khalifa International: Capacity here will be 40,000 and will be fullycompleted by Q3 2020. The legacy programme will see capacity reduced to 20,000 after the World Cup. Education City: Due to be completed by Q3 2020, it will have a capacity of 40,000 being reduced to 20,000 as part of the legacy programme. Al Rayan: Will be completed by Q4 in 2019 and have a tournament capacity of 40,000. This, like some of the others, will reduce to 20,000 in legacy. Al Bayat: In the North of Qatar, this stadium will host games in the second phase of the tournament and will have a capacity of 60,000. Legacy will reduce the capacity to 32,000. 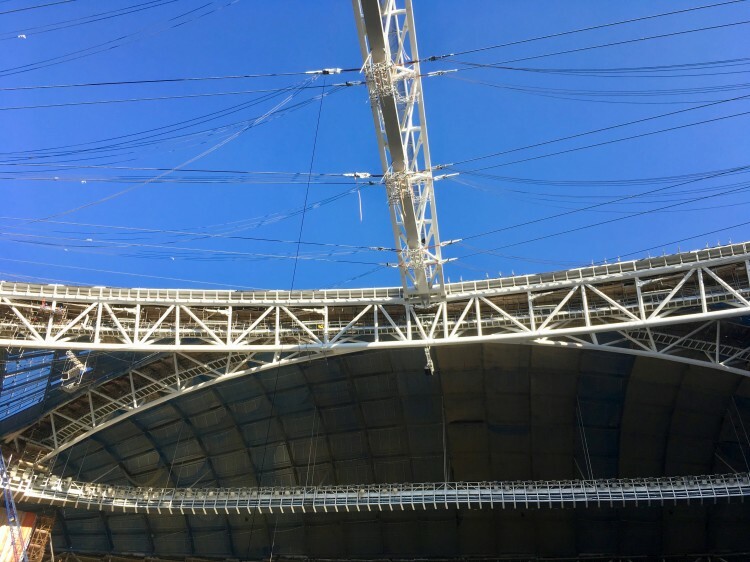 The stadium also has the challenge of the retractable roof. Lusail Stadium: Situated in the new city being built, which is remarkable to see in itself. The stadium will be the one to host the opening ceremony and opening game, as well as the final and closing ceremony. It will have a capacity of 80,000, which is required for the final by FIFA, reducing to 40,000 after the tournament. It will be completed in Q4 of 2020. Ras Abu: This stadium will be one of the fully demountable stadiums being used in the 2022 finals. Due for completion in Q4 of 2020, it has a capacity of 40,000 reducing to 20,000 after the finals. Al Wakrah Stadium: Will be completed by Q2 in 2019. It will have a tournament capacity of 40,000 reducing, like others, to 20,000. 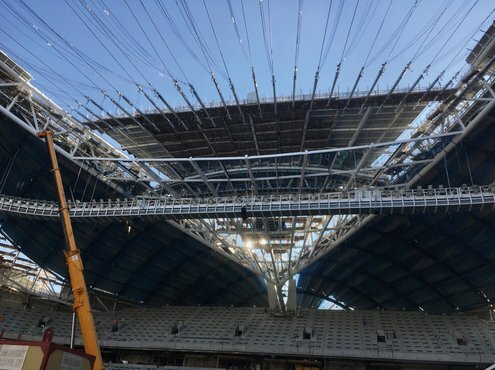 The stadiums look to be some of most futuristic ever designed for a World Cup and have the innovative idea of some of them being dismantled and donated to developing countries. PC: You were involved in the delivery of the 2018 Finals in Russia. What did you learn and how do you think Qatar will compare? AF: The experience I gained from my involvement in Russia during the build-up, and then in the finals, was invaluable. I was working for SIS Pitches who had contracts to deliver six pitches in Russia. The venues in Kaliningrad, Rostov, Samara, Saransk, Spartak and the final venue at the Luzhniki Stadium each threw up challenges which were met and helped deliver one of the best finals to date. It has been acknowledged that the pitches used in the Russia finals were the best collection of pitches seen at a World Cup. Being all hybrid helped and has shown the way forward. FIFA have held a very detailed debrief of the 2018 finals with the Russian LOC responsible for delivering the finals, and mandatory recommendations have been made to include hybrid pitches in the stadiums and venue specific training pitches in Qatar. The use of vacuum systems, which is something I agree with, has also been recommended. Russia saw the finals held in one of the biggest countries in the world and the 2022 finals will be held in one of the smallest, which will offer up unique opportunities. Despite being winter in Qatar, the warm conditions will be a challenge, but one I am confident we can overcome. Qatar is roughly 99 miles end to end and will offer the opportunity to centrally locate workshops and support facilities, which was not possible due to the sheer size of Russia. PC: You mention the climate of Qatar. Despite it being their winter, there will be extreme heat in the build-up to the tournament, how are you planning to cope with that? AF: We have already talked about the challenges of the heat. As we build up to the World Cup, we will have come out of their summer where temperatures are regularly in the high 40OC. The warm season grasses will be in transition, so the finals will be played on a mixture featuring ryegrass. There has already been quite a bit of work done on mixtures in Qatar, and part of my job early on will be to bring myself up to speed with that research. Much of the technology already in use in major stadia across the world, such as lights, fans and vacuum systems will form an integrated management system. I have always said I am not an expert in any one area of turf management, but have a very good working knowledge of what is required. I am forming a pool of experts to support me in my work and their individual expertise, combined with our appointed consultants, will be key in the final decision making on the pitches. These experts will be drawn from across the turf industry and some of them will be leading grounds managers. In some cases, where I think the grounds team would benefit from additional expertise and leadership, I will be looking to appoint grounds managers on a short-term basis. Many outside the industry never see the pressures groundsmen are put under preparing pitches for games. It is hard enough doing this for league games, but in World Cups it is much harder because of all the extra commercial activity before and in between games, and the intensity of the schedule. deliver this education with the help of partners. I see customised pitch maintenance courses being ideal here and I will be working to develop course content specific to the World Cup. The IOG were involved in one of my last projects in Kosovo and delivered a workshop in Pristina which went very well. A similar mode of delivery will be equally successful. I will also work with equipment suppliers to deliver a broader induction training to the staff involved. PC: What equipment will be used to carry out the pitch maintenance in Qatar? AF: Very similar to what you would expect to find in any major stadium now. 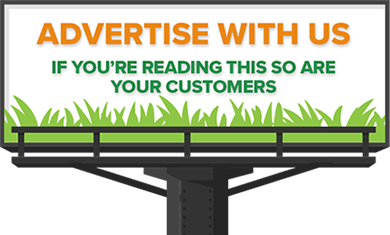 Until you work outside the UK, you do not fully realise the influence the UK turf industry has abroad. Many of the well- known brands you see at leading UK and world venues, such as Dennis/Sisis, Allett, Ransomes and Bernhard, are widely used. The specialised equipment is also well represented. Even though brands such as Redexim, Imants and Wiedenmann are built in Europe, they have had a big input from UK groundsmen which has helped them to get where they are now. We've now passed the minus four year milestone towards the finals and I will be speaking with these companies to build the most comprehensive range of equipment we can. Grow lights will also be required in Qatar. 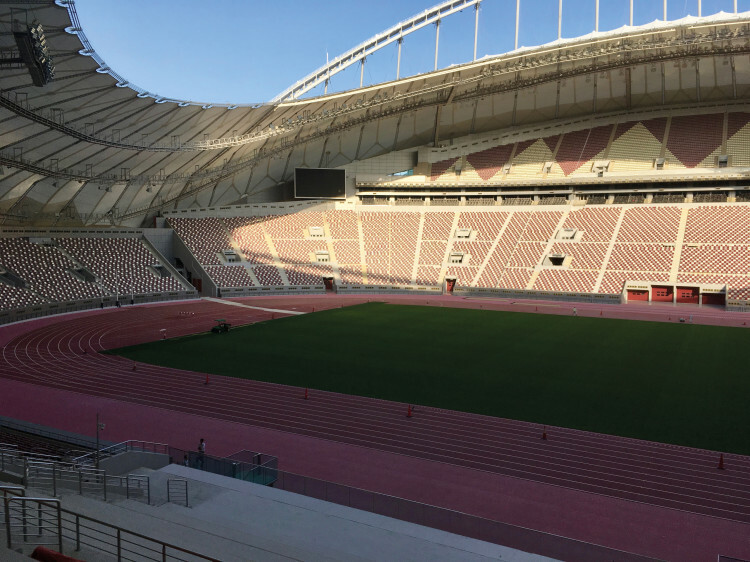 Nearly all major stadiums have lights and Qatar for the World Cup will be no different. SGL, MLR and TLS, amongst others, will all be considered to ensure we get the best. Most people talking about the World Cup in Qatar will not think grow lights would be required because of the sunlight they get, but they could not be further from the truth. The stadiums are very futuristic and, in summer, would not require the support from grow lights. The summer sun in Qatar is very high and nearly all the pitches enjoy full exposure to the sun at some point of the day. However, in the winter when the sun is lower, this is not the case. You have to consider that the species used for the tournament will be rye based and the pitches will be in transition from the warm season, so the growth and development of the grasses will be dependent on the support of the lights. In an ideal world, the transitional phase would be over eight to ten weeks, but we will have around four to five weeks before the games get underway. I am aware a lot of work has already been done in Qatar by the team in the LOC and Supreme committee and I will be discussing their findings with them and hopefully adding to it. Light technology is one of the fastest developing areas of our industry and I am sure will move on even further by the time we reach the 2022 finals. PC: You have talked about the contribution of hybrid pitches in Russia already. How important is its role in the stability of the pitches for a World Cup that will have an increased number of games at less venues? AF: It's massive. Many people who watch the World Cup only see the games. They do not see the pressure the pitches are put under from the various rehearsals and commercial activities that are part of a World Cup. In Moscow, the pitch in the Luzhniki Stadium hosted 85 hours of activity in thirty-five days. That is as intense a use as any pitch I know. Six of of the twelve pitches in Russia were SISGRASS whilst three were Grassmaster, and these nine performed really well and show the way forward for top level international tournament football. With four stadia less in Qatar to host the 64 games and the same amount of commercial activity, the use is likely to be as intense and the use of hybrid technology will be key to a successful pitch delivery. Using the FIFA regulation times for pre-match warm-ups and match time, the pitches will have to facilitate a total of 9,792 minutes which is 163 hours over the 64 games, giving an average of 20.4 hours per pitch. This doesn't include games that can go to extra-time or the various commercial activity, but is a great indication of why we needed to go with a hybrid. To reduce potential stress on the pitches, discussions are ongoing to move the Matchday One training sessions to a similarly constructed pitch close to the stadium. If I'm successful in achieving this, it will remove 128 one-hour training sessions from the match pitches. PC: Work has been going on in Qatar for a while now. How much infrastructure work has been completed so far? AF: The Qataris have been working towards the finals since 2010. Having the World Cup in Qatar is one of a number of projects going on to build up the country and raise its sporting profile. Three stadia will be completed by the end of 2018 with the remainder getting underway in 2019. Many other infrastructure projects are at various stages of completion. To increase the travel links, they are currently building a state-of-the-art Metro link which will feature driverless trains, operating on three lines, connecting all eight stadia to the main fan hubs. 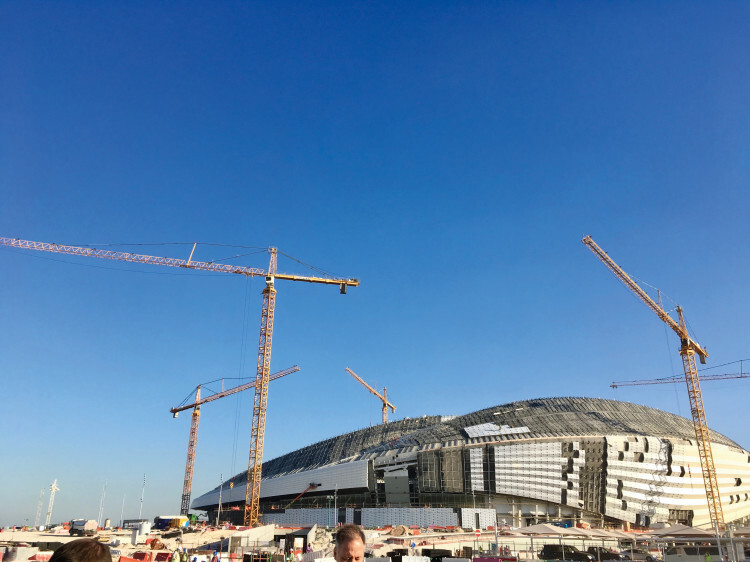 Work is also ongoing to increase the air capacity at both Hamid International Airport and the old Doha International Airport, and thousands of additional hotel rooms are under construction for fans at the 2022 finals. PC: Thank you for your time and we wish you well in your new role.